I appreciated Mr Ainsley’s letter and I would agree that the inherited resources of Northumberland Estates could and should be making a bigger contribution to the wellbeing and prosperity of the community in the ancestral Percy lands (Northumberland Gazette, January 17). Historically, wealthy landowners regarded this as a social obligation, consistent with their wealth and influence, or because there was an enlightened self-interest in cultivating the goodwill of the local population. This no longer appears to be the case. There is much that could be done to improve the appearance of the town and provide opportunities for local talent to be showcased. Also more could be done in setting aside land and resources for social housing, footpaths and cycleways, and supporting cultural, employment and educational opportunities for local people. As a large and profitable employer, the Estates could also guarantee a genuine living wage to its employees. Northumberland Estates operates as a property development company, maximising its profits by converting its land holdings into lucrative development. It has a near-monopoly on available land around Alnwick and 120,000 acres across Northumberland. As a large organisation, it can draw on vast resources and professional expertise – a veritable Goliath if pitted against parish councils and local communities in the planning process. Mr Ainsley refers to recent examples of this at the Duke’s Middle School site and Willowburn Industrial Estate. Another example is Lesbury parish where the final draft of the Neighbourhood Development Plan (NDP) is at the formal consultation stage after extensive input from the community. This has included a series of often packed meetings, regular updates via a team of volunteer neighbourhood champions, and a large-scale Housing Needs Survey, conducted by an independent consultancy and generating a very high response rate of 56 per cent. However, in November Northumberland Estates launched two housing schemes in the Lesbury parish area, highlighting the supposed benefits for the community of a big increase in its population and the infrastructure that would follow. In late December, planning applications were submitted for two housing developments on greenfield sites on the fringes of Lesbury and Hipsburn, totalling more than 100 houses, completely out of line with the emerging NDP and the Housing Needs Survey. However, Northumberland Estates argues that the NDP should be disregarded as it is still in the final consultation stage. It also reports on its own consultation, which appears to have been conducted in a haphazard way across Lesbury and Alnmouth parish area, going well outside Lesbury parish, in the period immediately before Christmas. This took the form of a questionnaire, which generated a 12 per cent response rate. However, local people are seeing these proposed developments for what they are – that converting fields on the edge of villages into housing may be profitable for the developer, but is not driven by the needs of the community and local economy. Often these developments provide upmarket housing for second home owners and wealthy retirees, rather than younger, economically active families. Neighbourhood Development Plans are not about blocking all development and new building, but they are about sustainable and beneficial development. This requires careful planning and democratic control, not a free for all. It would be far better for all if Northumberland Estates worked more collaboratively and openly with local communities and elected bodies. Rory Wilson provides a detailed defence of the activities of Northumberland Estates as a developer and investor in local infrastructure and the community (Northumberland Gazette, January 10). 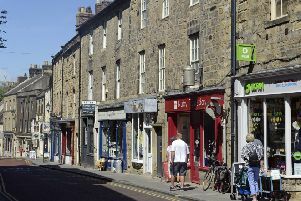 I am sure he has a genuine interest in a flourishing town and community, and this is to be welcomed, but many will also retain a degree of scepticism given their role in current planning disputes. The bigger picture here is that our economy and the prospects for the next generations are unbalanced, with too much of our national wealth held in too few hands in the form of land and property. We are a rich country, but we are not investing enough in low carbon industries and skills of the future. Instead, we have an economy run to prop up the property market and maintain a supply of cheap credit to drive wasteful consumption of the earth’s resources. Alongside this, we have austerity for many families, insecure and low-paid work, increasing use of food banks, and a lack of good quality and truly affordable housing.